Une production solide qui confère au titre une certains efficacité. Dommage que l'atmosphère soit tant calquée sur le tube de Perry. Another great pop offering from them, consistently good and great on first listen. Oh wow, this is even better than Wings! nichts neues, aber auch nichts schlechtes UND besser als "wings" ... fazit: gute prognose. Really don't like this. Sounds like a mix of Katy Perry's E.T. and some random teen pop track from the early 00's. 2* but I expect it to grow on me in the future. Das bräuchte ich ja hier in Deutschland auch irgendwie so gaaaaar nicht. Beliebiger überproduzierter Girlie-Dance-Quatsch von der Stange, immerhin eingängig. Not a fan. 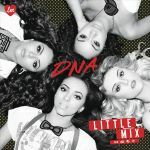 Having heard their first two releases, I'm thinking that Little Mix are not for me. Wings is more fun but this sounds cooler. I like that this is a totally different sound. I much prefer 'Wings', this doesn't do much for me and it's a bit bland. Wasn't that different from Wings. It's not so bad. Manufactured sound, not in a good way. Melody and message fail to impact. Nichts weiter als der übliche Dubstep-Pop, knappe 4. A shitload better than Wings. They have gone backwards since Wings! I thought they were said to be the new Spice Girls. I'm actually surprised that this did worst thatn 'Wings'. It's actually a lot better than their first single and probably my favourite as well. ▒ Zwakke, saaie, ééntonig plaat zonder eigenlijk iets nieuws brengend uit november 2012 van het Britse dames kwartet "Little Mix", voorheen "Rhythmix" geheten !!! Ik had er tot op vanavond ook nooit geen fragment van gehoord !!! Maar dat is nu wel duidelijk waarom niet neem ik aan ☺!!! I like the beat but I don't think much of the song as a whole. Just feels empty when wedged between Wings and Change Your Life. I often overlook this because it's not one of their standout singles like "Wings" and "Move" which I love, and though in the time I got into Little Mix I loved this, I forgot that I did and didn't regard it as high. Thankfully after giving it a listen more recently I've realised how amazing it is. The verses are my favourite things about it; the production is flawless and all their voices work so well against it. The chorus is great also, and though the bridge probably isn't as good, it's fine and it's just such a great song. My third favourite of theirs after "Move" and "Wings". Ich mag den, so muss moderne Dance Music klingen.